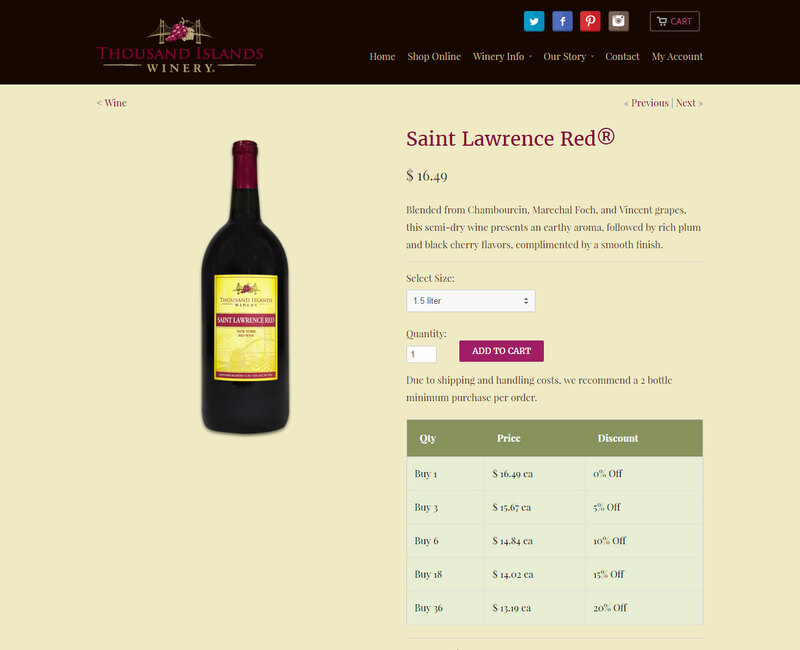 The Thousand Islands Winery (TIW) project is a similar, but significantly newer incarnation of the wine club system we developed in 2010 for South Coast Winery. This new system was built from the ground up using newer technologies and was integrated with a modern cloud-based SaaS e-commerce platform. The project required custom graphic design work for a beautiful front-facing e-commerce website as well as significant database+application layer programming for TIW personnel to manage their wine and rewards clubs. 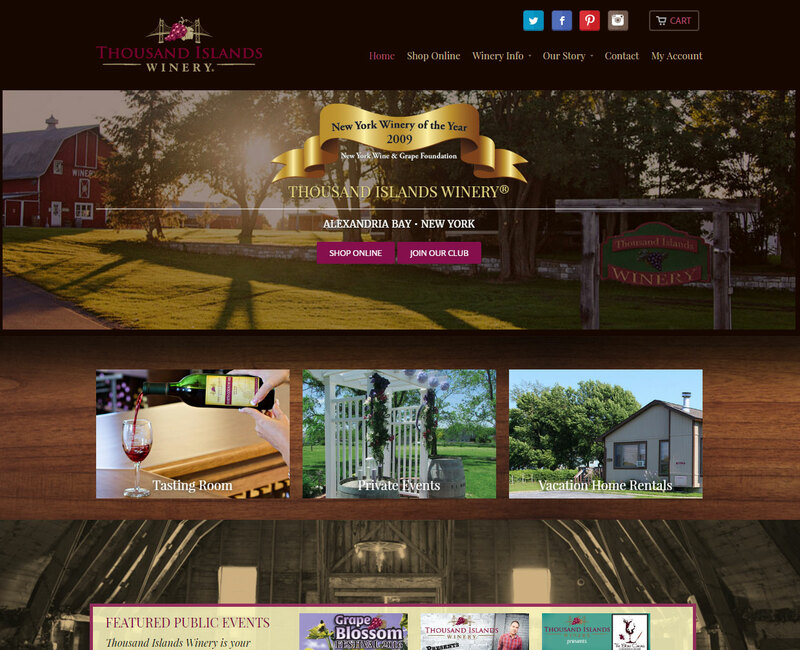 Home Page: The Thousand Islands Winery homepage features an elegant design that still uses warm lighting and textures to portray an upscale, but inviting feel. The main focus showcases a proud winery award and prominent call-to-action buttons for their shop + club. The next area below features a rich wood-grain background and can be used as shown or with featured products consisting of wine bottles laying sideways (not shown). Finally, the next area down contains a black and white background image of inside their signature barn building, which can be seen in the distance at top-left of the main header image. Product Page: The Product Page is where purchases are initiated and features a client-side script to change the product image according to the bottle size being selected. The page also shows a grid of volume purchase discounts to help entice the shopper to order larger quantities. 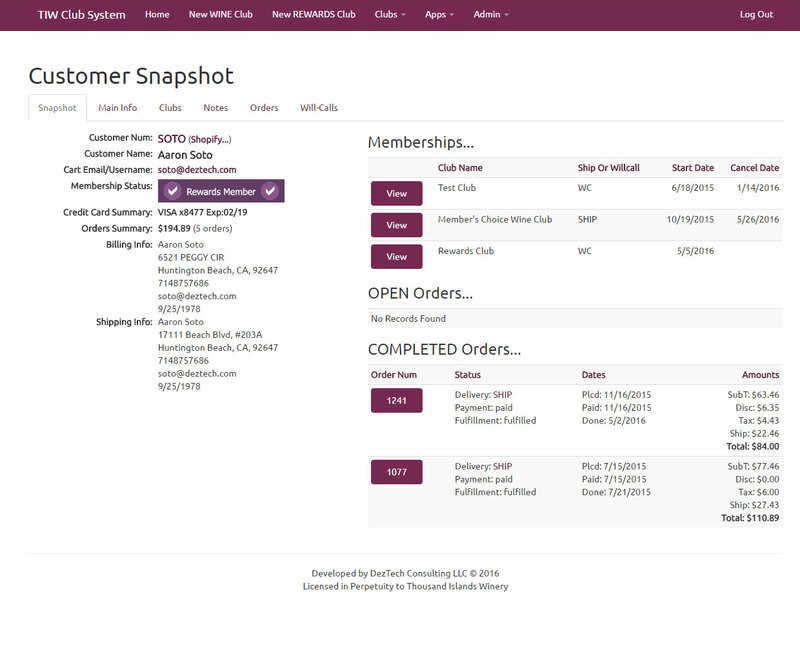 Club System – Customer Snapshot: The Customer Snapshot page allows TIW personnel a quick at-a-glance view of critical customer information as it relates to their membership status with the winery. Aside from fundamental contact information, a graphic icon depicts the customer’s status for easy identification so that personnel can offer the appropriate member discounts OR address any potential issues with problem orders or open will-call orders that need to be picked up. The right side features data grids for Memberships, Open Orders, and Completed Orders with the last two datasets being fed by information from their e-commerce platform.